Background: Thiazole ring is an outstanding structure found in many biologically active compounds and clinically available drugs. Because of synthesis simplicity of its derivatives and having a wide range of biological aspects along with high effectiveness, new thiazole derivatives have been studied by medicinal chemists since many years. Objective: Some thiazole compounds combined with different heterocyclic rings were acquired in this study. Novel 5-(4-substituted benzylidene)-2-[(4,5-dimethylthiazol-2-yl)amino]thiazol-4(5H)-one derivatives (4a-g) and 2-(heteroaryl-2/3/5-yl)thio-N-(4,5-dimethylthiazol-2-yl)acetamide (4h-p) derivatives were synthesized starting from 2-amino-4,5-dimethylthiazole. The obtained compounds were evaluated to determine their antiproliferative activity. Method: Final compounds (4a-g) were obtained with a ring closure reaction; other final compounds (4h-p) were acquired via the reaction of mercapto heterocycles with Hantzsch thiazole synthesis intermediate. To evaluate antiproliferative activity of them, the compounds were tested on A549 adenocarcinomic human alveolar basal epithelial cells line, C6 rat glioma cell line and NIH/3T3 mouse embryo fibroblast cell line according to the conventional MTT method. Besides, the selected compounds were studied to find out which pathway cell deaths caused via Annexin V/PI staining. Results: Compounds 4f, 4j and 4p exhibited the highest cytotoxicity on A549 with a non-toxic profile. Also, 4f, 4h, 4j and 4p were determined as the most antiproliferative compounds on C6 cell line. Furthermore, compound 4p induced apoptosis of A549 cell with a level of 23.5% and compound 4h induced C6 cell with a level of 37.5%. 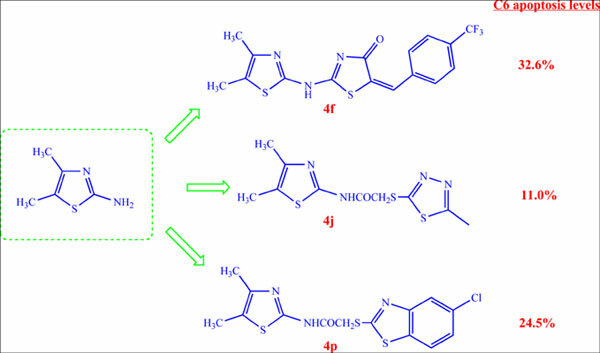 Conclusion: Considering the structure of the compounds, although thiazolidine containing compounds 4a-g exhibited higher activity in general, compounds 4p containing 5-chlorobenzothiazole moiety showed the highest cytotoxicity. It could be expressed with the conspicuous antitumor efficiency of benzothiazole ring. Keywords: Thiazole, thiazolidinone, lung cancer, glioma, cytotoxicity, apoptosis, hantzsch thiazole. Keywords:Thiazole, thiazolidinone, lung cancer, glioma, cytotoxicity, apoptosis, hantzsch thiazole. Abstract:Background: Thiazole ring is an outstanding structure found in many biologically active compounds and clinically available drugs. Because of synthesis simplicity of its derivatives and having a wide range of biological aspects along with high effectiveness, new thiazole derivatives have been studied by medicinal chemists since many years.